MEGA64 STRIKES ADULT SWIM!! PODCAST 105 APPEARS IN TOW!! Remember that big announcement we mentioned before? Today, we are pleased to announce that the folks at Gametap have hired us at Mega64 to create their new TV commercial campaign. 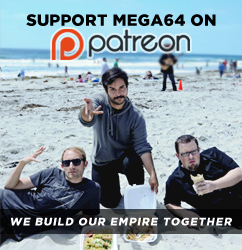 We made a handful of short, random bits promoting their site, and hopefully maintaining the level of comedic quality you have come to expect from Mega64 (which is to say, not much). Our ads will be airing first on Adult Swim, beginning next week. Next time your favorite show goes to a commercial break, you better stay seated and keep your eyes peeled for some Mega64 goodness! In the meantime, here's Podcast 105. In this week's show, we talk about the filming of our latest "Oregon Trail" skit, as well as a review of the movie "Moon," and a whole bunch of other stuff! Special guests: John Wanser and Dallas McLaughlin. Watch below or subscribe to the left. Audio version is here. It's an exciting time for us here at Mega64! Be sure to come back soon for even more cool stuff!